Maker and Designer Guide & Faqs - How to make music, movie, calendar, card, ebook, resume, label, button, icon, logo, banner etc. Photo Screensaver Maker Guide - Make own slide-show screensavers with photos, music and text captures, it can add (jpg/gif/bmp/png/tif/tga/pcx) and (mp3/midi/wav), and also can select various transition effects for your screensaver. PictureRiver Guide - PictureRiver is a spectacular slideshow screensaver with over 40 stunning special effects. Slideshow Screensaver Maker Guide - Create professional-looking screensavers using your photos, all your need to do is selecting photos and making a name. ScreensaverMaker Guide - Create screensaver based on Shockwave Flash, image, sound, Image Slide Show, Movies, and web pages etc. Mobile Ringtone Converter Guide - Convert audio to Mobile Ringtone as MP3, OGG, AMR, MMF, AMRWB, WAV, add recording track to audio. Easy Icon Maker Guide - Edit a transparent or opaque icon, of which the sizes may be 16 X 16, 32 X 32, 48 X 48, 64 X 64 or can be customed as you like. Acoustica CD/DVD Label Maker Guide - Create your own CD/DVD labels and CD jewel cases with the ultimate in ease and flexibility. 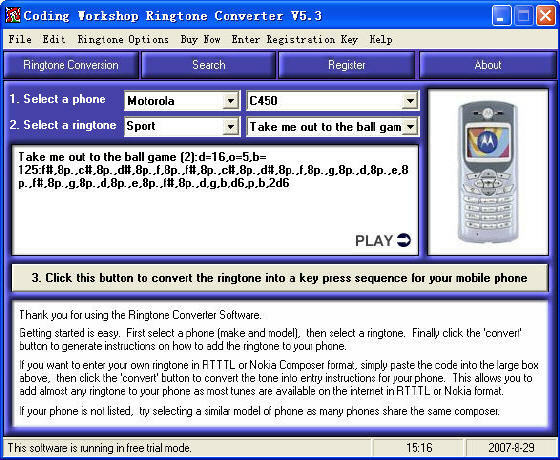 Coding Workshop Ringtone Converter Guide - Allows you to add new ringtones to your mobile or cellular phone whatever the make or model. Pos HTML Image Mapper Guide - Create graphic toolbars to your website, create HTML image maps for websites, link desired areas in a picture to URL's. 3D Button Creator Gold Guide - A tool for calculating 3D buttons to improve the graphical impression of your homepage or your own program. AddaButton Guide - Add handy custom "launch" buttons to I.E. 's own toolbar, to launch your favorite chat program, ftp program, multimedia player, or anything. Any Flash Screensaver Maker Guide - Make your own screensavers from your favorite Macromedia Flash movies, convert flash(.swf) to executable file(.exe), or convert exe to swf files. Power Screensaver Builder Pro Guide - Let you create your professional image slide show screensaver, shockwave flash screensaver and video movie screensavers. Mobile Music Polyphonic Guide - Convert your favorite MP3 WAV and midi music to mobile phone polyphonic ringtone, write your own music in Mobile Music Polyphonic. AudioLabel CD/DVD LabelerGuide - It is smart CD label software that helps you create and print CD covers, jewel case inserts, and DVD case labels. Pretty Icon Maker Guide - Create beautiful icons with ease, create, extract, and convert all windows icons from monochrome to Windows XP Icons with Alpha Channel. eBook Blaster Ver Guide - Create your own fantastic eBook, including eBook Title, Bookmarks, Toolbar, Buttons, Toolbar Button Text, Box etc. Precision Genealogical Tools Guide - Analyse and check a family tree for accuracy, take problems out of sharing data, identify data that has been exported elsewhere, modified, and then brought back in. Max Movie Maker Guide - An application for DVD/VCD/SVCD creating your own home movies from AVI, MPG, MPEG, WMV, ASF, DIVX file. HDX4 Movie Creator Guide - Convert MPEG-1, MEPG-2, VCD, SVCD, Video-DVD, DVD+VR, DVD-VR, various MPEG4 files HDX4 (MPEG4) with all known major profiles. AudiMovie Guide - Rip sound to mp3 files from VCD/DVD movie and burn audio files to CD tracks, customize audio quality and volume, language stream or track, Dolby Surround etc. FlexiMusic Generator Guide - A unique tool to generate musical and non-musical sounds, Merging or Mixing a few sound sources to create a rich musical instrument. iType Music Guide - A virtual music instrument that enables you to play 128 music instruments with your kerboard or mouse, and midi mixer integrated. Fx Magic Music Guide - Convert Wav to MP3, MP3 to Wav, CDA to Wav, CDA to MP3, Wav to CDA, MP3 to CDA, etc, create MP3 CDs and play most Windows audio format files. Art Plus Calendar Designer Guide - Insert your own images to numerous predefined layouts or create and print your own calendar designs. Calendar Maker Guide - Create customized photo calendars using your own photographs or sample built in photographs, and share your created calendars with other people. Greeting Card Designer Guide - Create amazing greeting cards in a matter of minutes and print them right-away on any Windows compatible printer. Business Card Designer Guide - Create amazing business cards in a matter of minutes and print them right-away on any Windows compatible printer. AAA Logo Guide - Choose one of 100+ pre-made logo templates as a start point for your logo project or create a blank logo project and make your own logo from scratch. Resume Builder Guide - Creates your own customized, professional and visually appealing resume only to choose style, template, and fill in your information. Doorway Page Wizard Professional Guide - Create Doorway pages for your website quickly and optimize your website, search engine so as to improve your website ranking. Trellian ImageMapper Guide - Create image mapped images for your website, support all image map shape types including rectangles, circles and polygons. Label Maker Wizard Guide - DVD and CD Label Maker Wizard walks you through the process of designing and printing CD and DVD labels, jewel case inserts and covers. Easy CD & DVD Cover Creator Guide - Design and print your CD, DVD, and Console covers, also include templates for cd and dvd labels plus case inserts, for both standard and slimline cd and dvd cases. 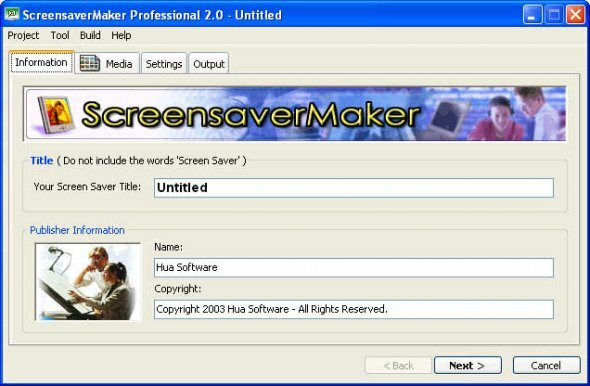 Flash ScreenSaver Maker Guide - Screensaver Producer is a powerful tool to create, compile and distribute screen savers for Windows, using Macromedia Shockwave Flash. YcySoft ScreenSaver Producer Guide - Create screen savers based on Shockwave Flash, Image Slide Shows (display your favorite photos) and Movies (Mpeg, AVI, WMV...). ArtIcons Pro Guide - An advanced icon utility for Windows, which allows professional and amateur, alike to create and edit icon images and manage icon files and libraries. Coffeecup Button Factory Guide - Create buttons for you website with given templates, your own images and also add sound to your button. Crystal Button Guide - Create professional navigation bars, web button images and various buttons with many awesome image effects! QS Flash Magic Menu Builder Guide - Create professional and magic flash menus, add various effects to the menus with given parameters setting and no need to program manually. Bryht Task Calendar Guide - A professional task manager which helps you schedule, trace and share your daily, weekly and monthly tasks.